This month we’re featuring another object from the Old York Historical Society’s “The Best of York” exhibit. The exhibit will be on view in the Remick Barn Gallery during the 2017 season. This large, wooden vessel is known as a Communion Tankard. It stands nearly 9 inches tall and is 6 1/2 inches wide at the base. The form is a very old one known as a “stave” tankard because it is constructed, like a barrel, using vertical strips of wood known as staves held together by bent wood hoops. Stave tankards were made in Scandinavia in great numbers for export to continental Europe and the British Isles. The Old York Historical Society’s tankard may have been one of the many tankards made in Scandinavia, or may have been made elsewhere in Europe or in York. It dates to the late 17th or very early 18th century. In Puritan New England churches, communion wine was poured from jugs or tankards into smaller cups for serving to congregants. This particular tankard reportedly was used for serving communion wine at York’s First Parish Church prior to the 1780s, when the church acquired silver tankards. However, given its age, the tankard may have been used at an earlier Puritan meetinghouse. It is thought to be one of the oldest surviving communion tankards in New England. “The Best of York” exhibit features over seventy rare artifacts, most made or used between 1690 and 1850 in Southern Maine and the Piscataqua Region of New Hampshire. Many of these objects have previously been in storage or were part of period room settings in historic buildings. Together, they tell the story of the development of one of New England’s oldest communities from a frontier outpost to a community of sophisticated tastes and world views. The exhibit is open to the public during regular museum hours, Memorial Day through October. Please visit the Old York website for more information. Over the next few months we’ll be sharing some highlights from the Old York Historical Society’s “The Best of York” exhibit. The public can view these objects during the 2017 season. Today’s “Best of York” object is a late Gothic reinforced document box. The box is oak with wrought iron fittings and an interior till for storing coins. Made in Belgium or the Netherlands around 1550, the box was decades old by the time New England was successfully settled in the 1620s. The box descended in the family of Henry Sewall (1576–1655) who was born in Coventry, England, and immigrated to Massachusetts in 1634. His great-grandson, Captain Samuel Sewall (1688–1769) settled in York around 1708. Henry’s father, Henry Sewall, Sr. (1544–1624), had been a wealthy linen merchant or linen-draper in the city of Coventry. In the 16th century, Flanders (now part of Belgium), held a monopoly on the production and sale of fine linen. English merchants like Henry Sewall, Sr., regularly imported large quantities of costly Flemish linen brocade, which may explain why this 16th-century Flemish-style box belonged to the Sewall family of York, Maine. Old York staff discovered a nearly identical 16th century lock in the Rijksmuseum, Amsterdam, seen here. “The Best of York” exhibit features over seventy rare artifacts, most made or used between 1690 and 1850 in Southern Maine and the Piscataqua Region of New Hampshire. Many of these objects have previously been in storage, or were part of period room settings in historic buildings. Together, they tell the story of one of New England’s oldest communities development from a frontier outpost in the 17th century to a community of sophisticated tastes and world views. The exhibit is open to the public during regular museum hours, Memorial Day through October. Please visit the Old York website for more information: oldyork.org. 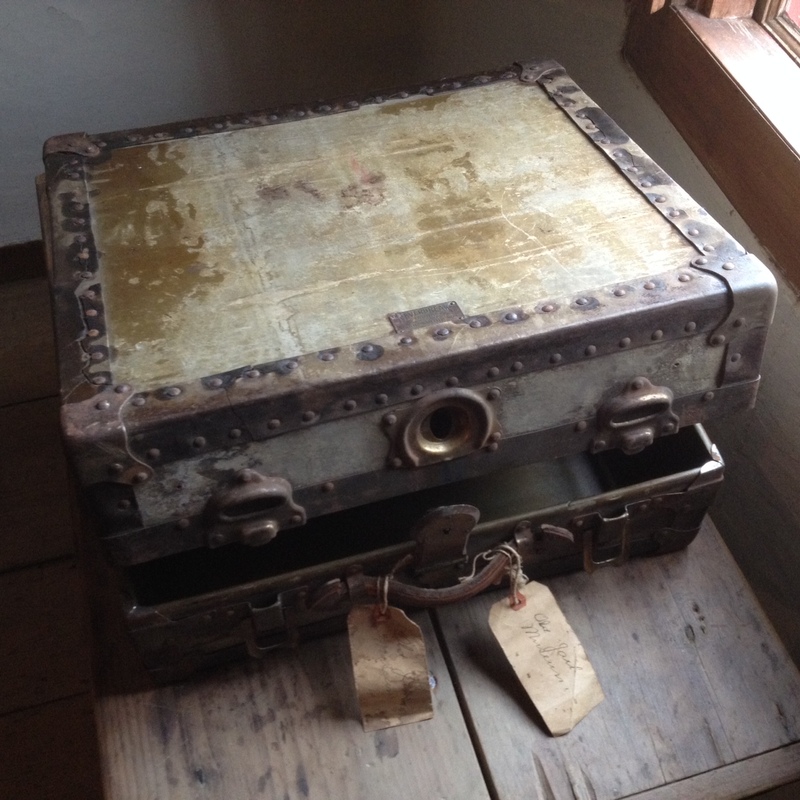 In early 1908 an unassuming suitcase was delivered to the Old Gaol Museum (now part of Old York). When Museum custodian Sophia Turner (1856–1936) opened the case, however, she realized immediately that the contents were far from ordinary—an almost-complete set of colonial American crewelwork bed hangings. The whimsical embroidered flowering vines, fruit trees, and animals as fresh in color as the day they were made. A lyrical poem by Isaac Watts, “Meditation in a Grove” (published in Horae Lyricae, 1706), adorns the inner valances, and is the only known use of verse on a set of American bed hangings. 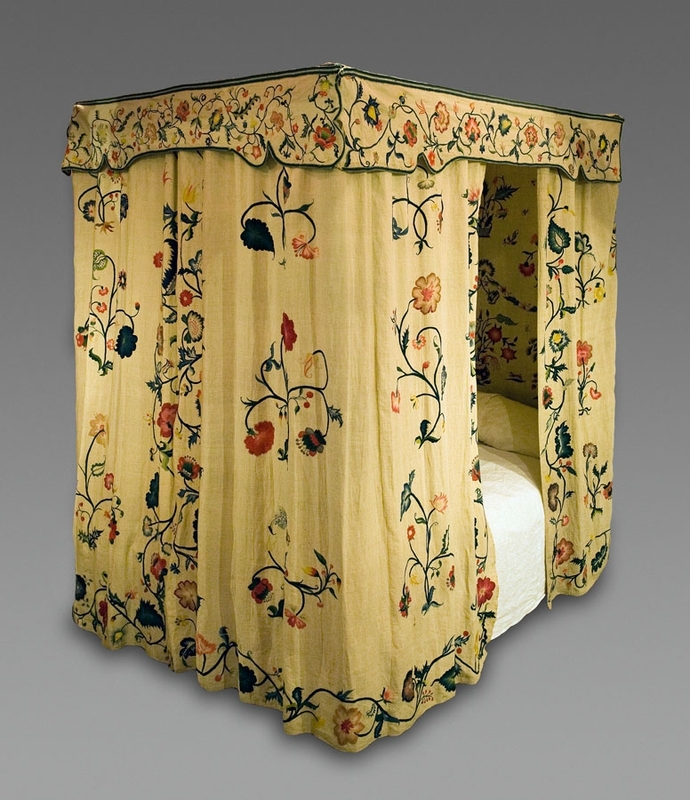 The set was created by Mary Swett Bulman (1715–1791) of York, Maine, in the 1730s, and consists of four curtains, a head cloth, tester cloth, three outer valances, and three inner valances. The embroideries came to the Old Gaol Museum as an entirely unexpected gift from Anna Everett (1825–1909) of Roxbury, Massachusetts. A relative of the Swett family by marriage, Everett sent the embroideries to the Old Gaol just a few months before her death. Today, the bed hangings are the crown jewel of Old York’s collection, and are widely considered a national treasure. They have been on almost continuous display since they arrived in 1908, and although they are in exceptional condition for their age, they have suffered somewhat from more than 100 years of exposure. The Museum is pleased to announce that this past summer it became the recipient of a $35,000 grant from The Coby Foundation of New York City to conserve the Bulman bed hangings. The grant will allow Old York to have the textiles cleaned and stabilized, as part of a larger project to create a new, more comprehensive, and preservation-minded installation for them in the museum’s gallery. The conservation of the textiles will be carried out over the next year, and the bed hangings will be placed back on public view by the end of 2016. With the guidance of an advisory panel of renowned curators and textile experts, Old York intends to take this opportunity to comprehensively document and study the embroideries, hoping to reveal more about the history of the textiles, the people who made and cared for them, as well as their construction and curious design. We will be telling the fascinating history of these bed hangings through a series of posts on this blog, introducing readers to the talented team of experts involved in the project, as well as documenting the conservation and reinstallation process, and sharing new findings. Please join us on this incredible journey! The Coby Foundation was established in 1994 by Irene Zambelli Silverman in honor of her mother, Irene Meladakis Zambelli. Mrs. Silverman described her mother as “the finest needlewoman in New York.” The Foundation funds projects in the textile and needle arts field. Its funding is limited to non-profit organizations in the Mid-Atlantic and New England. Old York is extremely grateful to the Foundation for its support of this important project. This week’s mystery object is a seam rubber. Like its name implies, it was used to smooth and flatten the heavy canvas, making creases in sails before the seams were stitched. The fact that it is carved from whalebone adds another interesting component. Originally, the term “scrimshaw” referred to objects made by sailors from the byproducts of whaling, such as bone, teeth and baleen. A seam rubber would have been an important tool in a sailor’s kit. Over time, the term scrimshaw has come to include the more whimsical pieces made by sailors in their spare time. What is the iron? A liquor bottle with a no drinking policy! 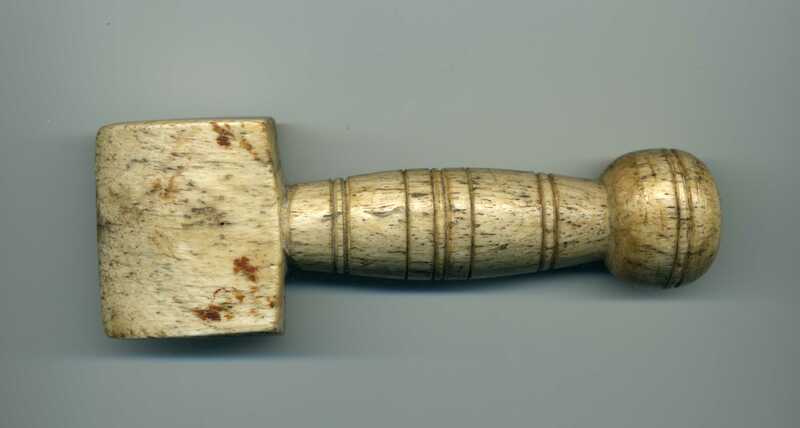 This week’s mystery object was a little tricky. 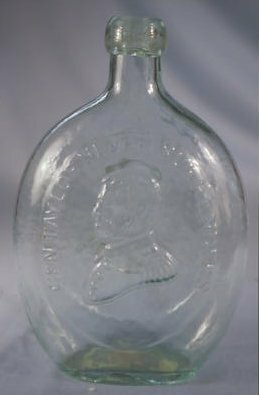 The bottle which depicts the image of General Taylor on one side and George Washington on the other, was produced by Dyottville Glass Works between 1847-1849. 1. No swearing, improper or abusive language. 2. $5 fine or dismissal for breaking the rule prohibiting liquor on the premises. 3. $5 fine for disobeying the orders of a superior. 4. Personal cleanliness and “necessary ablution” before meals, school and church. 5. Use of all fines to purchases books for the Dyottville Apprentices Library. 6. Strict prohibition of every species of gambling. 7. Immediate notification of the one’s superior in case of illness, so another could take his station in the factory. The irony was code #2; workers who produced liquor bottles were prohibited from inbibing alcohol! What is it? 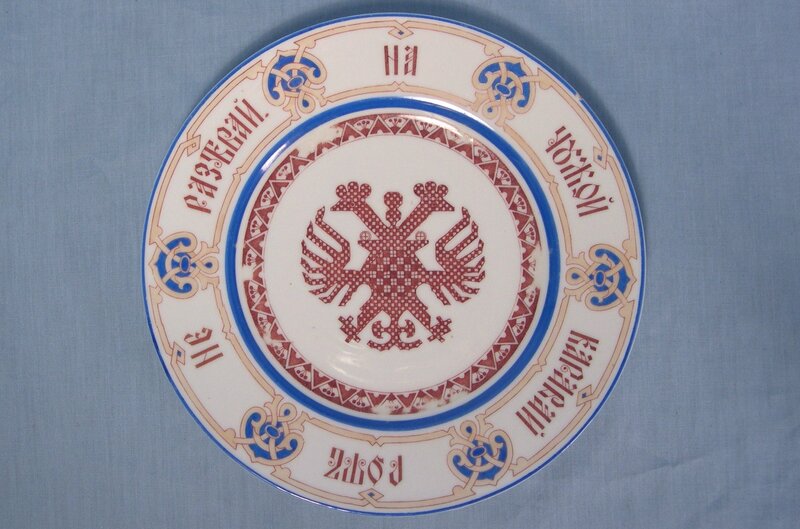 An imperial Russian plate! This is one of four porcelain plates brought back to York, Maine by Miss Elizabeth Perkins and her mother, Mary (Sowles) Perkins, from their travels to Russia (1896 & 1909). It can be identified as being from Imperial Russia not only by the double-headed eagle in the center, but also by the cyrillics (“lettering”) that are used. The Russian orthography was changed shortly after the 1917 revolution; the plates retain the older cyrillics from the late 19th-early 20th centuries. The set was made by the Korniloff Brothers, who had a factory in St. Petersburg, Russia. The factory closed in 1918 when all businesses were privatized by the government.